DAMASCUS, Syria (BP)—For Hanna, a Syrian Christian mother living in Damascus, the country’s civil war is more than just statistics and news articles. As the conflict between President Bashar al-Assad’s forces and rebel fighters rages on, the country’s Christians fear they are becoming easy targets for Islamic extremists. 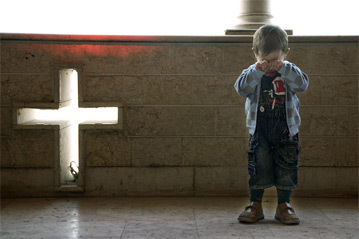 Nina Shea, who directs the Hudson Institute’s Center for Religious Freedom, wrote in the National Review Online about the plight of Syria’s Christians. She relayed a report by the Vatican news agency Fides about the discovery of a mass grave containing 30 bodies near the ancient Christian town of Sadad. Since Oct. 21, rebel-allied Islamist militias have killed 45 people there in total. St. Theodore’s Syriac Orthodox Church, along with other churches and a monastery, have been desecrated, Shea wrote, and about 2,500 families have fled Sadad. Rebels allied with al-Qaeda have not been shy about imposing their harsh view of Islam on areas under their control. The town of Raqqa, CNN reported, formerly was one of Syria’s most liberal cities before Islamist radicals took over. Now locals call it Tora Bora. After attacks by Assad’s regime on the town, moderate rebels were pushed aside by foreign jihadist rebels from the Islamic State of Iraq and Syria (ISIS), a militant group with links to al-Qaeda. They started indoctrinating children with their extreme view of Islam. Edicts began springing up on the town walls — No smoking. No cameras. Women could not walk alone or style or show their hair. A man called Adnan, whose name was changed for fear of his safety, was caught writing anti-ISIS graffiti and filming. The jihadists dragged him into a church they had torched and turned into an ISIS base. “Every 15 minutes, someone poured water on me, electrocuted me, kicked me, then walked out,” he told CNN, adding that the screams of other tortured prisoners was worse than his own pain. “When a person is tortured in front of you, you feel responsible. That’s the hardest. One guy still inside used to call me Dad as I taught him about democracy,” Adnan said. Shea wrote that Syria’s top Catholic leader, Gregorios III Laham, the Melkite Greek Catholic patriarch of Antioch and all the East, estimates more than 450,000 of Syria’s roughly 1.75-2 million Christians have fled their homes since 2011. Hanna wrote to Open Doors USA that she and her husband struggled with that decision. Many new refugees from Muslim backgrounds are appearing at her church, she wrote. They say they have lost everything but in Jesus have found what is most important.